What performance advantages does horizontal screw – belt concrete mixer have? 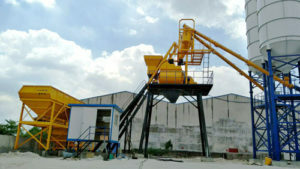 Now used by the manufacturer of the horizontal ribbon concrete mixer through a lot of improvement in terms of structure, equipment mainly u-shaped structure, the construction method can speed up the work, and equipment in terms of its selected components has also been a lot of adjustment, the horizontal ribbon mixing equipment in the process of operation is very stable and reliable, equipment is also increased by double blade structure, so the material after to the interior equipment can stable operation, the material can also be through faster together on both sides of the device, and within a certain amount of time complete material mixed tasks, such a hybrid material contact area is larger, Chemical and physical reactions can also be completed during this period. Using horizontal ribbon concrete mixer can be mixed with sticky materials processing, equipment of processing range is very wide, can also on powder material and liquid material such as mixed operation, the advantages of the equipment in the aspect of structure processing process were also provides many conveniences, equipment is complete open door design approach, so in through the horizontal screw with mixing equipment for material processing tasks can more easily during cleaning.